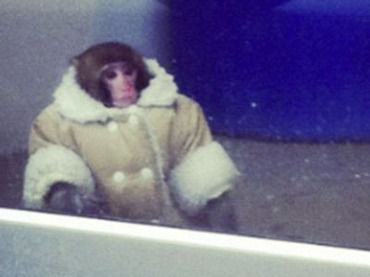 A monkey dressed in a winter coat and a diaper was spotted wandering curiously outside an IKEA store in Toronto much to the surprise of customers who started tweeting pictures of the animal. Toronto Police Staff Sergeant Ed Dzingala described the animal as a "smart monkey". It managed to open its crate, unlock a car door and go for a stroll in the IKEA parking lot, The Globe and Mail reported. In the end it was taken into a corner by store employees and police to wait for the arrival of animal services. The monkey turned out to be a rhesus macaque, a species that is illegal to own in Ontario. A City of Toronto spokesman says charges were laid against the owner, who will have to pay a fine of $240 for having a prohibited animal in the city. The monkey was reportedly unharmed, although a bit alarmed with the avalanche of attention from customers.